Classic pineapples and filet crochet create a vintage heirloom-quality table topper for your holiday decor. 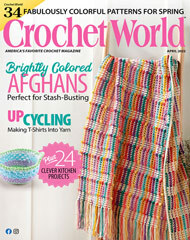 This e-pattern was originally published in the December 2001 issue of Crochet World magazine. Size: 32" square. Made with size 10 crochet cotton thread and size 7 (1.65mm) steel crochet hook.